Look-o-Rama: a mirror on a bendable cord that would enable you to see baby’s face from your place behind a front-facing stroller. Is baby happy? Asleep? Or gearing up for a really big shriek…? We knew we could patent this one. But we never got around to it. Surely Graco’s got a version of this by now but I wouldn’t know because my kids aren’t babies anymore. L.A. Parasol: Really cute, fashion-forward parasols for the modern-day gal who wants to avoid melanoma. It could be big, especially if marketed right (Gwen Stefani would love one of these). But maybe somebody is already on this. Probably. 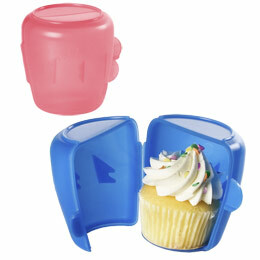 Cupcake holders: A way to transport a damn cupcake without manking up your impressive frosting job. Turns out, somebody beat me to this, too. But I couldn’t have been happier. Because it meant that I got to take home the very last of Audge’s orgasmatastic red velvet cupcakes from a Fourth of July pool party the other day. Hostess extraordinaire Liz Haynes presented me with the cupcake lovingly protected in a pink Cup-A-Cake container, a contraption I had never seen before. Truly you would have thought I’d found a $20 bill stuck to the bottom of my shoe by the way I jumped around with delight. It’s like discovering the wheel. Especially if you’re a mom with school-age kids. This simple whack-I-shoulda-thought-of-this-myself container brings great happiness and convenience to my life. Now I can send cupcakes to school. Now I can send the nits away with a delicious frosted present from home. It might even make my infamous brain cupcakes retain their grey matter-ish shape. Every mom needs five or six of them. And yes, the Bad Home Cook heartily approves of this product. Find a store where you can order these puppies here.